Congress has passed legislation renaming the Hobe Sound National Wildlife Refuge after Florida environmentalist Nathaniel “Nat” Reed who passed away earlier in the year. Last week, the U.S. House passed a proposal from U.S. Rep. Brian Mast, R-Fla., changing the name of the refuge. 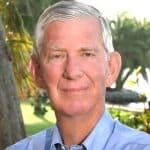 The Senate passed a similar bill from outgoing U.S. Sen. Bill Nelson, D-Fla., and U.S. Sen. Marco Rubio, R-Fla.
“A well-known and widely respected conservationist who championed Everglades restoration, Nat Reed was instrumental in advocating for state and national environmental policy. It is a fitting tribute that the Hobe Sound National Wildlife Refuge, where his passion for nature was first inspired, be named in his honor,” Rubio said. During a trip to Canada back in July, while fishing, Reed slipped and hit a rock, never regaining consciousness after the accident. Reed was just shy of his 85th birthday when he died. Born in 1933, Reed came from a prominent family, including tracing his roots to Edward Doty who arrived on the Mayflower. His grandfather Verner Reed was a leading figure in Colorado’s early history and helped found the family fortune while his father Joseph Verner Reed owned much of Jupiter Island. Reed’s brother, Joseph Verner Reed Jr., who passed away in 2016, served in the World Bank, as David Rockefeller’s assistant at Chase Manhattan, as ambassador to Morocco under President Ronald Reagan, as chief of protocol under President George H.W. Bush and in key leadership roles for the United Nations. Graduating from Trinity College in Hartford, Connecticut in 1955, Reed served in the U.S. Air Force. In 1967, he was named as a special assistant for the environment to Gov. Claude Kirk, the first Republican to lead the Sunshine State since Reconstruction. After Democrat Reubin Askew defeated Kirk in 1970, Reed headed to Washington, working as as assistant secretary of the Interior in the Nixon and Ford administrations. Reed also served on the Governing Board of the South Florida Water Management District and held leadership roles with a host of groups including the National Audubon Society, the Nature Conservancy, the National Resources Defense Council and 1000 Friends of Florida. He also helped co-write the Endangered Species Act. Reed’s impact on the Sunshine State can be seen in his efforts at launching the Everglades Foundation and helping launch Big Cypress National Park in Southwest Florida.